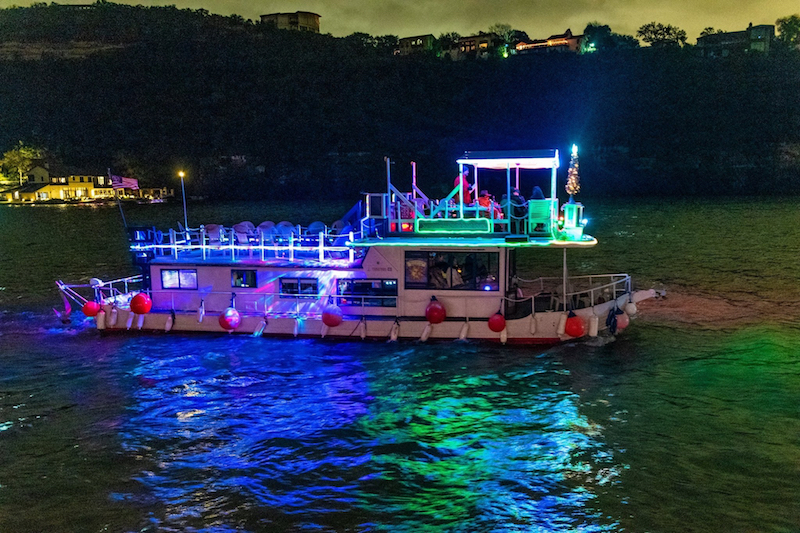 Take your party on a private scenic river cruise on a boat with personality! The Sunshine Machine is great for office parties, entertaining out-of-town guests, birthdays, swimming parties, weddings and wedding-related events, team building and other special occasions. has a CD player, TV, VCR , DVD player, microwave oven, running water, changing room/restroom and comes with a crew of two. 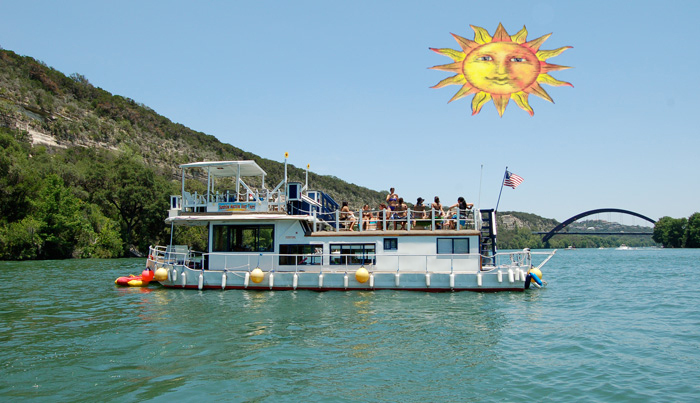 We are located on scenic Lake Austin, at Ski Shores Marina, near Emma Long Metropolitan Park [City Park]. Cruise under the Pennybacker  Bridge and enjoy the view of spectacular cliff top and lakefront homes. Bring your binoculars to get a close look at the numerous species of waterfowl and other wildlife that are abundant on this beautiful and less-traveled section of the Colorado river. Feel the cool breeze off the water upstream while you float through some of the lushest scenery Central Texas has to offer. Bring your ipod, iphone or laptop computer and hook up to the Sunshine Machine sound system . We're available 7 days a week, 12 months a year. Parking available AT the boat. Bring your own food, or arrange to have food catered:caterers. To experience most ideal conditions on the lake, we recommend Monday through Thursday. Click here for a 360 degree view of the boat! Ready for something more than your usual party barge? Click here for an aerial view of the boat! Check out our facebook page! : http://www.facebook.com/SunshineMachine.